I still stick by what I said about being over the summer. I’m ready for pumpkin flavored everything, apple pie and mashed potatoes. Give me a cardigan and jeans and I’ll be all set. Now, ice cream is a different story. So is an abundance of great fresh veggies. Like zucchini, which we always eat plenty of this time of year. This side dish was delicious! Preheat oven to 375 degrees. Put zucchini, tomatoes and onion in a small baking pan. Add salt, pepper, garlic powder and oregano, then drizzle oil on top. Sprinkle desired amount of cheese over veggies. Cook for about 30 minutes. Remove from oven and scoop into a serving bowl. Add rice and stir to combine. Serve. 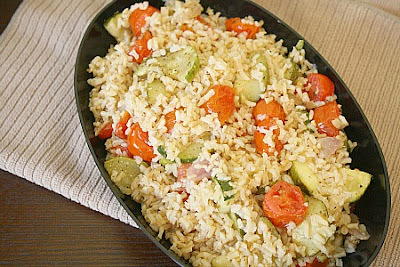 This entry was posted in rice, side dishes, tomatoes, zucchini. Bookmark the permalink. Oh, this sounds great! I love how quickly it comes together!